Watermarks are text or pictures that appear behind document's text. They often add interest or identify the document status. You can see watermarks in Paged layout mode. They can be printed and exported to all rich-text formats, except HTML. More on the specifics of the format providers you can find here. 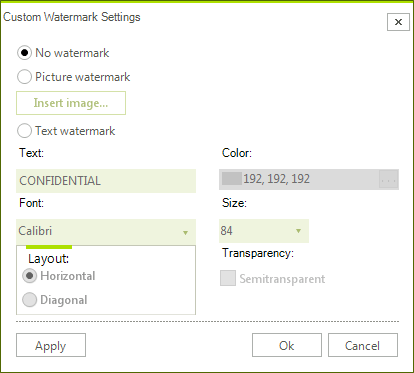 Alternatively, you can create your custom watermark from text or picture through the Insert custom watermark option. There are two types of watermarks - text and image. Both of them are shown behind the contents of the documents - text, images, tables, etc. and are applied on a per document basis. You can create custom watermarks using the WatermarkTextSettings and WatermarkImageSettings classes and the respective methods of RadRichTextEditor - SetWatermarkText() and SetWatermarkImage().